Turbines at the newly-commissioned SWiFT facility. SWiFT is the first moderate-scale facility designed to investigate, test and develop technology for wind plants. (Photo by Lloyd Wilson) Click on the thumbnail for a high-resolution image. The U.S. Department of Energy (DOE), Sandia National Laboratories and Texas Tech University commissioned the DOE/Sandia Scaled Wind Farm Technology (SWiFT) facility today at the Reese Technology Center in Lubbock, Texas. The SWiFT is the first public facility of its kind to use multiple wind turbines to measure how wind turbines interact with one another in a wind farm.The event featured speakers from the DOE’s Wind Program, Vestas Wind Systems, Sandia and Texas Tech. 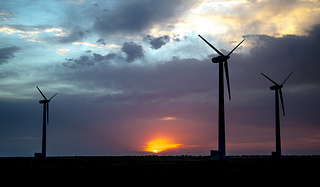 “The Energy Department’s wind testing facilities, including the Scaled Wind Farm Technology site in Texas, support the continued growth of our nation’s clean energy economy while helping to speed the deployment of next generation energy technologies and bring more clean, affordable renewable power to American homes and businesses,” said Assistant Secretary for Energy Efficiency and Renewable Energy David Danielson. Jon White of Sandia’s Wind Energy Technologies Department, technical lead for the project, said SWiFT is the first moderate-scale facility — allowing up to 10 wind turbines — specifically designed to investigate, test and develop technology for wind plants. “Some estimates show that 10 to 40 percent of wind energy production and revenue is lost due to complex wind plant interaction,” said White. SWiFT will host both open-source and proprietary research as the result of a partnership among Sandia, Vestas, Texas Tech’s National Wind Institute at Reese Technology Center and Group NIRE, a renewable energy development company. White said the three-year process to develop the facility has been both rewarding and challenging. “It has been a phenomenal experience to work with a diverse team to complete the often under-appreciated process of turbine construction. We also had a 1980s-era, smaller turbine rebuilt to perform like a much larger machine,” White said. “The project was a complete green-field construction so there was tremendous complexity in scheduling and managing all of the agreements and contracts to access to the facility, verify there wouldn’t be an adverse environmental impact, procure the equipment, and contract numerous specialized labor resources. We succeeded primarily because we have a dedicated and competent team and a steadfast DOE customer,” White said. Researchers have begun planning the site’s first research projects. White said the two primary research projects for the next year will be testing and evaluating Sandia’s new National Rotor Testbed Project and collecting baseline data for turbine-turbine interaction that can be used by the international community to improve wind plant performance. The National Rotor Testbed Project will provide a public, open-source complete rotor design that the wind energy community can work on collaboratively to bring the best technology to market as rapidly and cost-efficiently as possible, White said. Funding for the work comes from the DOE’s Office of Energy Efficiency and Renewable Energy. View the SWiFT media kit, see a time-lapse video of the facility construction, and visit the Wind Energy Flickr photo set. For more information on SWiFT, see previous news releases (Vestas to install research wind turbine… and Advanced wind energy projects…) or visit the SWiFT website. Sandia news media contact: Stephanie Holinka, slholin@sandia.gov, 505-284-9227.